This selection of special recipe cat food from Waitrose offers a convenient and nutritious way to care for your pet. 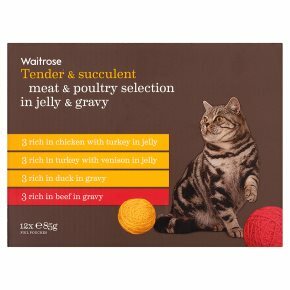 The poultry selection pack includes 12 pouches in four different flavours, each of which can be served up with the minimum of mess and fuss. Flavours included are; chicken with turkey, duck and rabbit, turkey and venison and goose and bacon. Additives: Nutritional Additives; Vitamin D3 100 IU/kg, Vitamin E 15 mg/kg, Calcium iodate, anhydrous 0.8 mg/kg, zinc sulphate, monohydrate 39 mg/kg. Additives: Nutritional Additives; Vitamin D3 100 IU/kg, Vitamin E 15 mg/kg, Calcium iodate, anhydrous 0.8 mg/kg, zinc sulphate, monohydrate 39 mg/kg. Emulsifiers: Cassia gum 1.3 g/kg.